Will I make it?" These were the questions Id kept asking myself. crystal clear, no wind, and very cold! Our headlamps were ready, but the moon was shining so brightly that we didn't use them. Yesterdays snowfall now seemed almost luminescent. Restus, our mountain guide, set the speed as he had done during the past four days. We were now all comfortable and adjusted to his slow, almost meditative, tempo. Clive had been tireless in his efforts to train us to breathe slowly and strongly. Now his persistence was paying off in averting the dangers of high altitude exertion. We also wore scarves around our noses and mouths to shield our lungs from the cold, dry air. Though cold when I started, my body warmed as we zigzagged steadily up the mountain. After a few hours, the scarf covering my mouth had frozen, and my backpack was covered with frost. But I felt great  it was strange how I could feel so comfortable in these conditions. Every so often Id look upward, straining to see the top of the mountain. However, I grew tired of seeing the peak so far off, seemingly always the same distance despite our progress. I vowed not to look again until I knew that we were close to our goal. The group had split up, and I was now with three other climbers and two guides. We kept at our pace persistently. 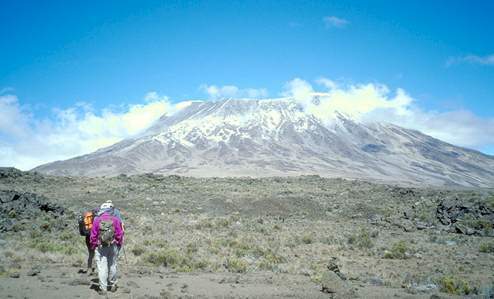 When we reached an area strewn with boulders, we realized that with another 500-foot gain in altitude we would reach the crater rim for the final climbing stage. However, now the going was tough, as we had to scramble through steep, loose terrain to reach the coveted rim. We were still scrambling when the sun rose and covered the mountain in a fantastic orange glow, giving us a needed mental boost to overcome this wild section. We rested for a while when we reached the rim at Gillman Point. Mentally, this was the toughest part of the climb. We were exhausted and we knew that Kilimanjaros summit, Uhuru Peak, was another 1-1/2 hour trek along the Kibo Crater rim. Many people stop at Gillmans and call it a day, but we decided we wanted to make the real summit. So we didnt rest for long, fearing that we would lose our resolve. Our progress was slow, and the extremely bright sunlight reflecting in the enormous ice fields made it hard to stay focused. No longer walking steadily upwards, my breathing had lost its rhythm. I was starting to get dizzy and tried hard to concentrate on my steps  begging for that peak to come closer. Along the trail, we met a guy who had carried his girlfriend from Gillmans Point to Uhuru Peak and was now on his way back. If he could do that, I should be able to at least carry myself there! Again, I got a mental boost that carried me forward. Descending, of course, was much, much quicker. I was still feeling a little lightheaded, and after passing Gillmans Point and the 500 feet of boulders one of the guides grabbed my arm and we halfway ran, halfway slid, down the mountain. It was really fun and it got us down the mountain quickly. When I reached 15,500 feet altitude I immediately felt better. We had lunch at Kibo hut  well, I still didnt feel like eating, but the cold Coca-Cola I drank was the second highlight of the day. actually made it. I climbed one of the worlds "seven summits." Now, only six to go!! 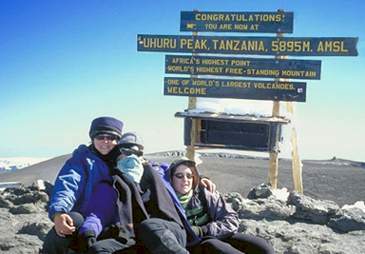 Courtesy: Mountain Travel Sobek [Mountain Travel Sobeks "Kilimanjaro and Beyond" trek follows the Rongai Route, walked by Rick Ridgeway in The Shadow of Kilimanjaro. 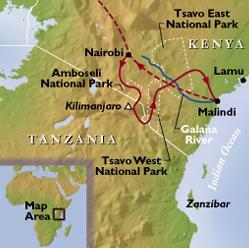 In addition to the climb, the journey includes tracking wildlife with Masai warriors across the plains of Amboseli and a foot safari in Tsavo East with many species of game along the wild Galana River. The mountain-to-sea journey is complete with a visit to the Indian Ocean coast to bask in sybaritic pleasure at a deluxe resort and unwind from the safari].